It occurred to me watching Ocean's 8 that it has been a while since Sandra Bullock has had a big summer release. Not that she ever went anywhere, but it's nice to have her back. As Debbie Ocean, she is terrific as the calm and collected leader of the group of thieves (cool goes without saying, in an Ocean's movie). Debbie has been recently released from prison and although she's still beautiful and glamorous, Bullock plays her slightly faded, with a subtle but persistent sadness in her eyes. She really needs this heist to work, if only to prove something to herself. Luckily, Ocean's 8 is destined to be a hit. The film is a continuation of Steven Soderberg's Ocean's movies. That trilogy featured two very good movies and one great one and was based on a mediocre Rat Pack vehicle from 1960 (on the Sinatra scale of cool, Ocean's 8 is more Nancy than Frank). Soderberg's influence can be clearly felt on this film, but, unfortunately, only in spurts. Gary Ross, who directed 8, takes a mostly conventional approach to the movie's visual look, evoking Soderberg's stylistic flourishes only during certain key sequences. The screenplay, by Ross and Olivia Milch, is fast-paced and full of great lines. The heist itself, which involves stealing a $150 million diamond necklace from the neck of a famous actress during the Met Gala, is less complicated than the heists from the earlier films. Still, it is as satisfying as it can be, given that important information is withheld from the audience until it's all over, a tradition carried over from its predecessors. With a smaller ensemble than the one from the Soderberg films (8 versus 11), this movie spends more time with each of the members. This is great, as it gives wonderful little moments to Rihanna, Sarah Paulson, Awkafina, and Mindy Kaling, whose transition into movies will be exciting to watch. Helena Bonham Carter is also fun, and Cate Blanchett's dynamic with Bullock recalls that of Brad Pitt and George Clooney. The best performance in the film belongs to Anne Hathaway, who plays the bratty movie star wearing the necklace. Hathaway has amazing control over her physicality and her breath; every turn of her head is something unexpected and clever. The film also has enough cameos to rival any Muppet movie, ranging from the expected given its Met Gala setting (Anna Wintour, Alexander Wang, Katie Holmes) to the bizarre but welcome (Dakota Fanning, Marlo Thomas). Two members of the earlier Ocean's team pop up for cameos, but I won't spoil them. 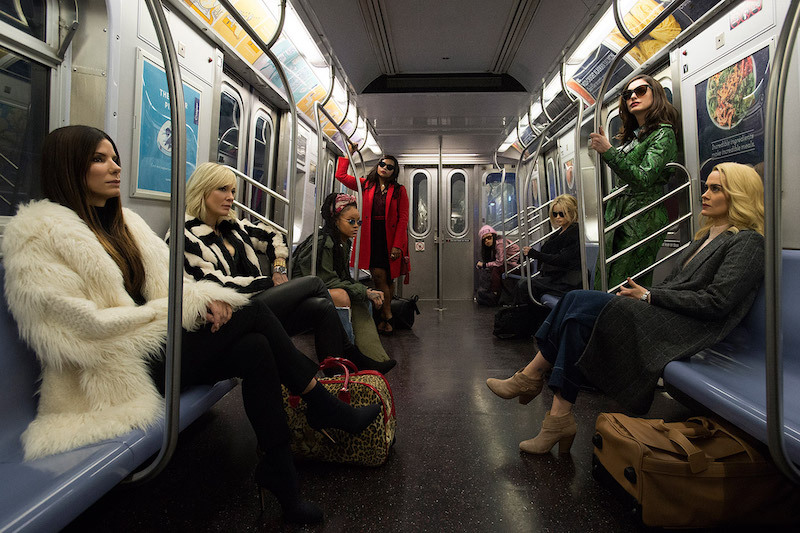 Above all else, Ocean's 8 is just really fun to watch. Great actresses delivering great lines in great costumes. What more could you possibly want from a summer popcorn movie? Ocean's 8 is in theatres June 8.